Once again the topic of play and play objects has been coming up a lot in our conversations. Both of us have little boys around 3, and little girls, who are in their first year of this big adventure called life (and in case you want to ask – no, we did not plan this!). Once again we are reliving the first moments and observing the first discoveries our little girls make daily. As our daughters are slowly becoming more and more interested in the world around them (and inevitably also their brothers’ cars!!! ), we are again wondering about toys, or rather as Magda Gerber called them ‘play objects’, that are suitable for our little people. We believe in Free Play. Observing our kids every day, we have grown to believe that self-initiated, self-paced and child-led activities is what children ‘need to do, to learn and to grow’. So how do we make sure their environment encourages this kind of play? More and more research hints at simple, open-ended objects as ones that are most likely to be used continuously, over and over, and stimulate the imagination of children regardless of the age. Since we repeatedly have conversations about play and toys with friends and strangers (believe it or not), we noticed this question comes up a lot: But what exactly are open-ended toys? Open-ended toys don’t come with a set of instructions, so they don’t have a ‘right’ way in which they ‘should’ be used. This way they not only stimulate the imagination, but also allow self-initiated play, simply because children don’t need any help or explanation to use them. And while they engage all the senses, and stimulate development in all possible areas, their use in imaginative play can also have positive impact on the development of executive functions, specifically self-regulation skills. With safety considerations in mind, of course, these kinds of objects can be used by any child, at any age or any stage of development. Why? Because they do not need to be used in a specific way, that requires a specific stage of development. And why else? Because these kinds of toys get a new life every time a child picks them up – they start out as perfect mouthing objects, move on to being something that is fun to bang on the floor, and end up being… coffee grinders (have a look at the photos – that face that A is making, he is actually making ‘coffee-grinder noise’). So when thinking about toys for your baby, maybe you don’t need to head into the overstuffed and jammed toy stores. Just look around. Most of them you can find in nature or in your house anyway. 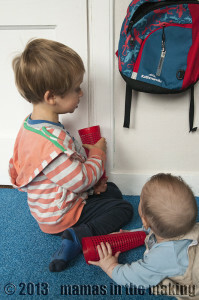 When looking through kitchen drawers you might find tons of things you could consider toys – well, your children will! Have you ever wondered why babies are so attracted to shoes or toes, to the pegs you use when doing laundry or the sock you just dropped? Because our children are not asking for anything fancy. They can have fun with EVERYTHING in reach. And even better: they naturally know how to do so. We don’t need to teach them. But that again is a whole other topic. What are your children’s favourite open-ended toys? We LOVE to hear your thoughts! My daughter is 3 1/2 and uses just about anything in our household: cutlery, chairs, bowls, blankets, the laundry rack, stones and chestnuts, clothes-pegs, pillows, washing-up-brushes, her toy boxes (emptied *grrr*), buckets, beans … I can’t really tell which are her favorites, but I guess this is what you mean. Of course she also loves her lego bricks and wooden toy blocks, does the jigsaw the “right” way and is interested in more active toys or in other children’s toys with buttons. I am just fascinated by her imagination, whether she builds “roadsweepers” with building bricks or prepares icecream sundaes of stones/pebbles, and I am glad about it. We’ll see what the 6-month old will do – right now he uses everything as mouthing object, but I guess that’s not really unusual. I saw a great post on fb about asking people to give gifts of Experiences rather than toys. For example, a day at the zoo with Grandma, a morning at the park with Uncle. What a lovely idea – exerience instead of things. I must try it out this year for Christmas! Proudmama1218! Thank you for sharing it – so lovely to be able to observe their amazing adventures, isn’t it? GLad to see you here! My daughter’s favorite bath toy, is the brightly colored tops off the squeeze tubes of pureed fruit/vegetables that she had from about 9 months old. I cut the sharp edges off them, and they have been building blocks, people, counting items, various foods, things for floating, or sinking, animals in a boat, and way more play objects, and they are still going at coming up to 3. Diane, thanks for sharing – what a good idea too. It is amazing how little things can become nearly everything :) Happy to see you here and thanks for stopping by to read and share! ALways love to read about what other kids do in their Play! Thanks for sharing your info on open ended play objects… I agree and I often tell people not to bother spending their money on what I like to call ‘plastic fantastic toys’. I’ve watched my own two children engage with shop bought toys and I can honestly say the interest in these objects is very limited. But give my children a wooden bowl, some large buttons and an empty kitchen roll results in hours and days of interest and play…. And their games are ever changing with the same objects! Jo, thank you for stopping by and taking time to write. Yes, I absolutely agree – my son is over three and to this day his favourite toys are in our kitchen cupboard. Large buttons are a great idea though, need to try this one too! Thanks!! I work in a nursery. We have to be very careful with not introducing anything that is a choking hazard. Also, if anything gets put into anyone’s mouth, we have to wait until their finished with it and then immediately wash it. So…Any ideas for open-ended toys for children 15 months – 2.5 years keeping those factors in mind? Thanks!!! Slightly deflated beach balls; balls and o-balls; old handbags; blocks; wooden bowls, wooden spoons etc. 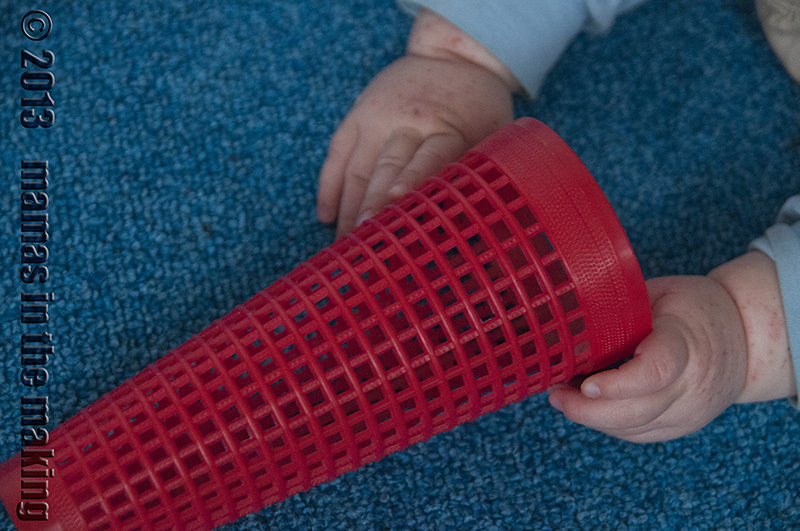 We are working on a post on open-ended toys for kids one year and up – watch this space. Great article. My first experiences with open ended toys for my own child were inspired by others: at a restaurant with a fussy baby our waitress used a cloth napkin to play peek-a-boo and put the napkin on the baby’s head and his cries turned to squeals of joy instantly. It was a miracle in front of our eyes! Another fussy time at a friend’s house, my friend whipped out spoons and spatulas and bowls and immediately engaged the child. I finally began remembering some of my favorite times with pots and pans, or a huge refrigerator box, or jumbo cardboard blocks. We don’t buy many toys, and if we do, it is along the lines of the suggestions in the article (these toys also tend to be less expensive, so another bonus!). One of the first toys I bought my baby was a set of 10 cups that were gradual in size and color and could stack or nest. He was immediately drawn to them and has been playing with them for a year now. If he grabs something at the house that is safe for him to play with we just let him and clean up later. I’d rather encourage his curiosity than tell him “no!” and have a clean house and cranky times for all. Recently, he’s been playing for days with a measuring cup. When I had to get up with him in the middle of the night with him I would keep the lights off and give him a flashlight, and he eventually learned how to turn it on and off himself and now just has a great time. He loves the “parachute game” when I make the bed and fluff the sheet on top of him and he runs around underneath. Tupperware is also a great plaything-lids and stacking and nesting and drumming and containing… He gets so much exposure to technology, tv, and computers, and presents from family and friends that light up, that we really try to “keep it simple” to try to keep him grounded and encourage his imagination. Ahh, what a lovely story, thanks for sharing! ANd what a great attitude to have – let them play with whatever is safe, you can always clean up later. I agree! Kids hear ‘no’ often enough, and letting them rule their own play is a true gift. Thanks for stopping by and hope to see you here again!! I blog about play too! Our fav is sand. Julie! Where can we find your blog? Would love to read more about play! I love this post. Thank you for this, and all the comments on this. It is so helpful to read others who have the same experience. I am not a mother, but have been a second mother to my two nephews, ages 3.5 & 22 months. I’ve lived with my sister and her husband for over 2.5 years, watching the progression of their life as a new family. I’ve seen the gifts my nephews have received from grandparents, the “active” sound-making toys that are so exciting at first, but generally they lose interest, or get frustrated when they can’t get the result they want (such as a favorite song that plays with only one particular button). When my first nephew was younger, we as a family were just beginning to open our eyes to the possibilities of letting one’s child play with everyday household objects instead of your average toys. Over the course of their lives, we’ve gotten rid of almost all acquired toys that were one-sided, keeping the most imaginative and open-ended items that they go to over and over again, that stimulate creativity and wonder. Even some puzzles seemed to hit a dead end. Now for this past Christmas, my sister wrote a pleasant email to all the extended family requesting no gifts this year, stating that the boys love to play with spatulas, dad’s socks and shoes, and straws more than anything else. It’s so true! And it’s so lovely to watch them invent, create, and discover new uses for things. Recently they’ve been making machines with funnels, cups and straws in the bath, lawn mowers, cannons, bows & arrows… The junk drawer is their favorite place to get new materials and tools. Watching the results of endless possibilities in action is truly a joy! Oh Janelle, thanks for that! I will be going over to check out your blog right now – the topic of free play and passive toys is sooooo important! Great!!! !